"Departments were in general unable to make real value-for-money savings of 3% a year following the 2007 Comprehensive Spending Review - and that was at a time of increasing budgets. Now that much more radical cost-cutting measures are required across government, my committee is gravely concerned about the ability of government to make efficiency improvements on the scale needed." Worse, nearly two-thirds of these supposedly achieved savings are not provable in any meaningful sense. They are products of wishful thinking and deckchair rearrangement. "Departments were generally unable to reconcile their reported savings to either their financial accounts or to their spending agreements with the Treasury." Of course, for regular BOM readers it won't be shocking at all. For years we've been blogging the fantasy world of Gershon delusion and the Marx Brothers - the preposterous idea that Whitehall can achieve huge efficiency savings without saving any actual money, or making anything demonstrably more efficient (see many previous blogs eg here). 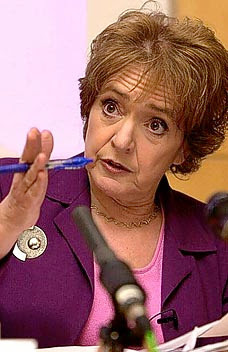 But for poor Margaret Hodge it has all come as a nasty shock. The real question is what should we do about it? The left's answer - widely aired on the BBC yesterday - is that it means the coalition's spending cuts are unachievable without massive damage to our public services. Departments cannot do efficiency and to assume they can will consign schools and hospitals to a new dark age. Stop the cuts. QED. In fairness to the PAC, their report (as opposed to the headlines based thereon) doesn't say that. Instead, they argue for more transparency on efficiency savings, with more explicit reporting of inputs and outputs so everyone can see whether important services are being cut. They also want the Treasury to take a much larger role in guiding and verifying the savings. Which all sounds kind of sensible in a marginal improvement kind of way. But the real message from the report - the real message from Margaret - is much more radical. The real message is that to make serious efficiency savings - the kind private business is constantly making - we need radical reform in the way our public services get delivered. In particular - and we do apologise if we've said this a few times before - we must break up our big state monoplies in areas like health and education. We must have choice and competition across the public services. Because the key reason that businesses like Tesco are so good at driving efficiency is not because they are inherently much smarter than public sector managers. It's because they face a completely different set of incentives. They know that they must deliver what their customers want or perish. And a large part of that delivery comprises value for money. If they get fat and inefficient, they can't deliver value and they lose their customers. We have never believed we can make monopolistic public sector elephants dance. And whether she understands it or not, that is precisely what Margaret Hodge told us yesterday. Margaret's message is that we must learn from her party's failure. To make cuts without destroying the delivery of public services, the coalition must tackle the underlying problem. They must break up the public sector and unleash the power of choice and competition.